Believe it or not, summer break is over here in sunny Florida. School starts in a couple of days and before we know it, it’ll be Christmas. But for now, I’m focused on back to school. 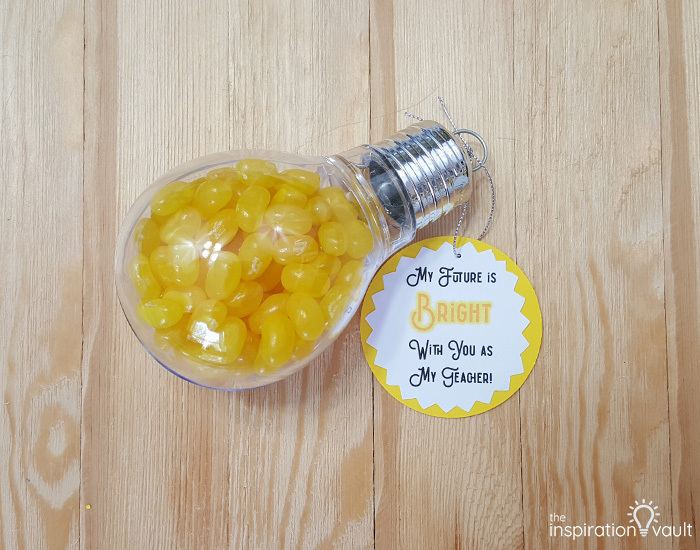 I found these cute plastic, fillable light bulbs at (I wanna say) Michael’s a couple of years ago with the intention of filling them and giving them to my son’s teachers. I got as far as buying the candy and then it was suddenly Christmas. 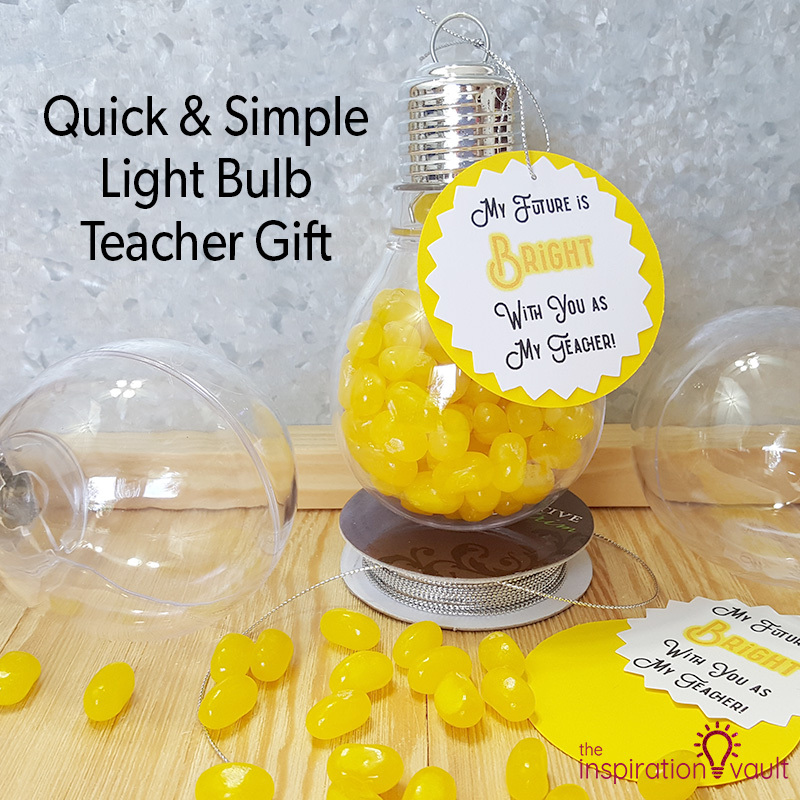 Speaking of, this Quick & Simple Light Bulb Teacher Gift can also be turned into an ornament, so it’s like two gifts in one! 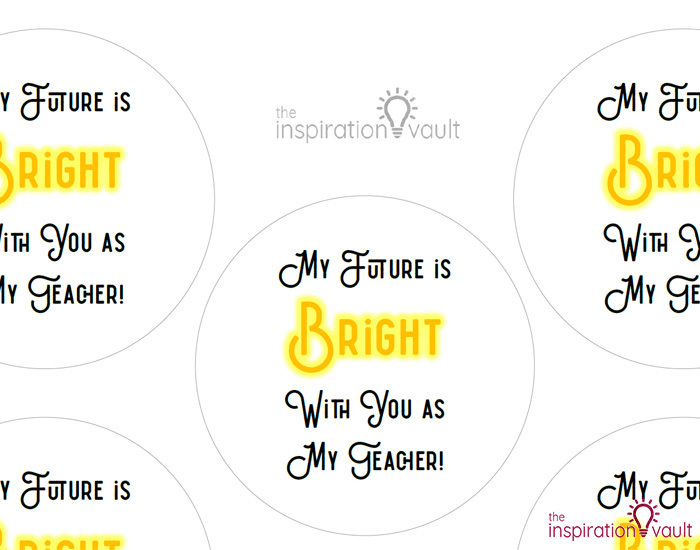 1: Print out the fun tags I made for you on white cardstock. 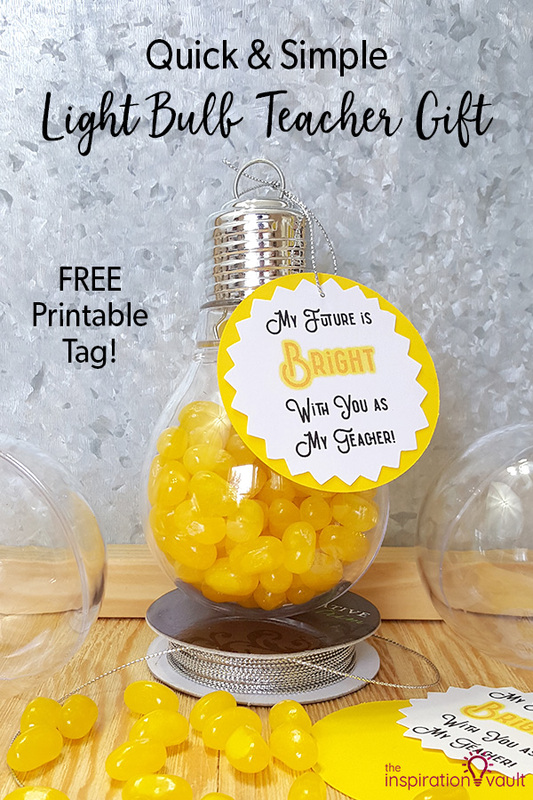 Just click on the image below or click on this Light Bulb Teacher Gift Printable Tags link to open the PDF document to print. 2: Punch or cut out your tags. 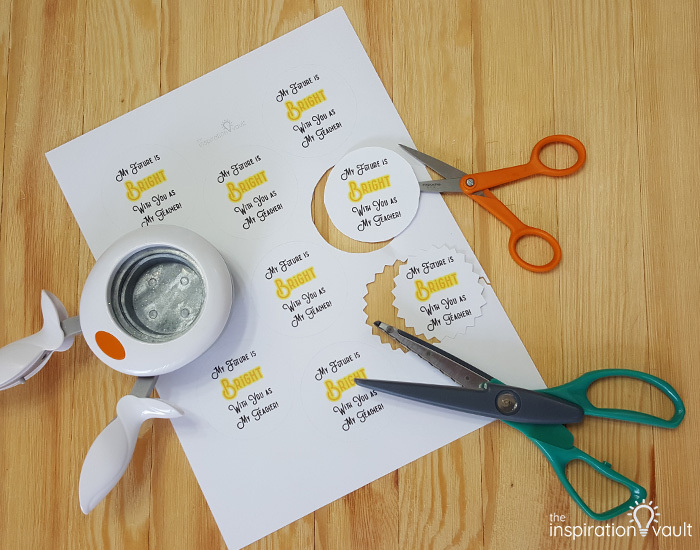 The tags print with a faint gray circle you can use to guide you as cut them with regular scissors or you can go old school and use some zigzag scissors. You know how long I’ve had those zigzag scissors? 20 years people! And I still like to use them sometimes. 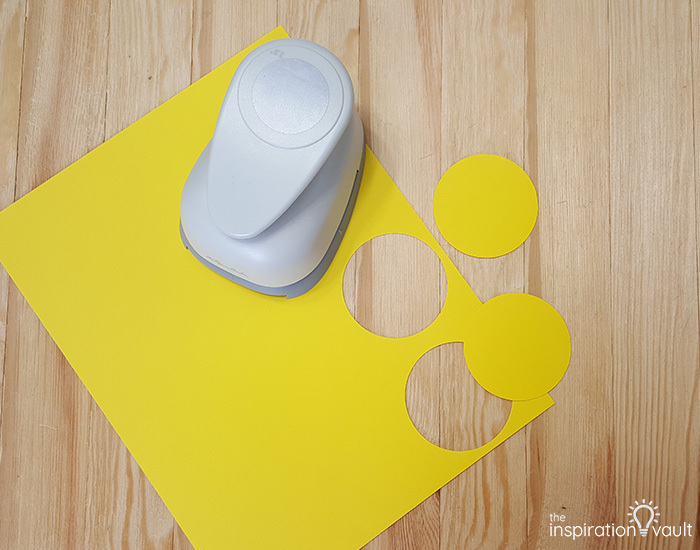 You can also use a 2-inch circle punch or a circle cutter. 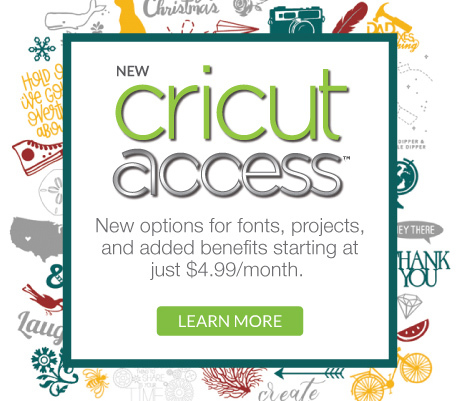 Crafter’s choice. 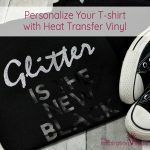 And of course, you can use your cutting machines, but I bet I could hand cut these faster than it takes to set all of that up. 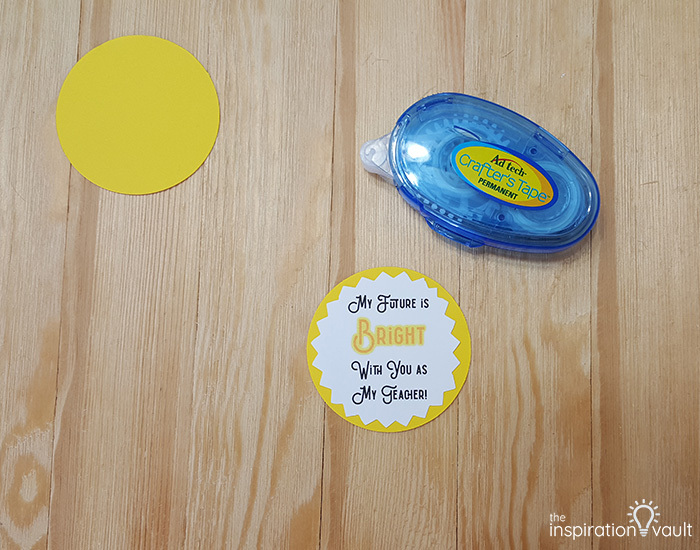 3: Punch out circles with your 2.5-inch circle punch on the yellow cardstock. 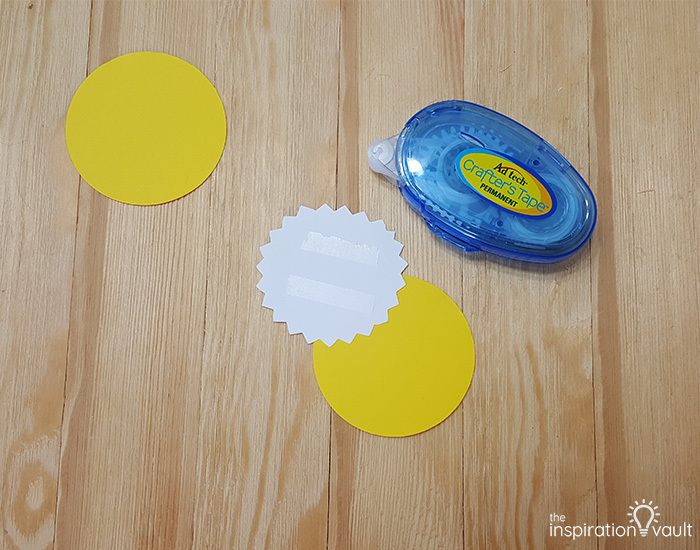 4: Use the tape runner to put adhesive on the back of the white circles and stick them to the yellow circles. 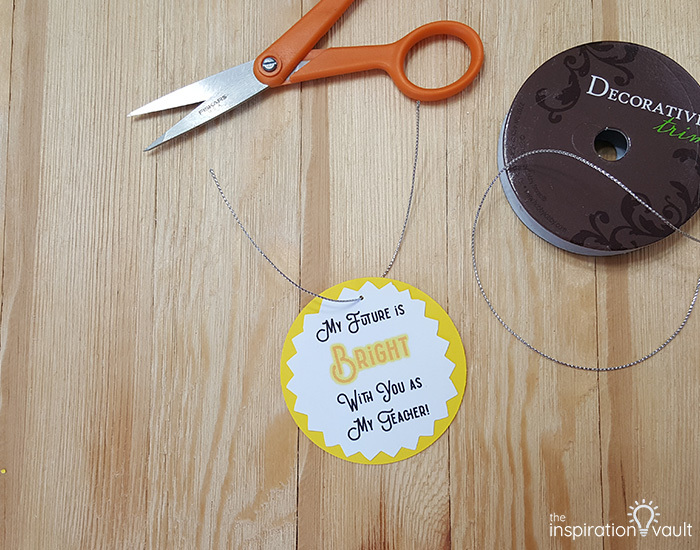 5: Use the tiny hole punch to punch a hole at the top center of the tag. 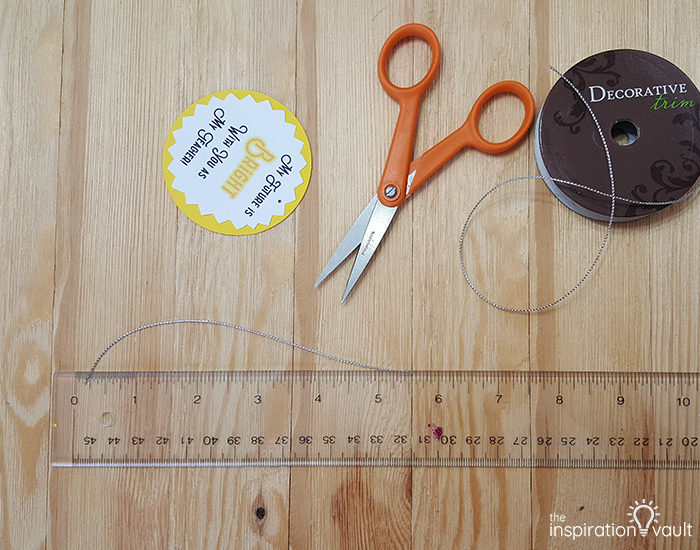 6: Cut 6 inches of the thin silver cord and poke it through the tiny hole on the tag. 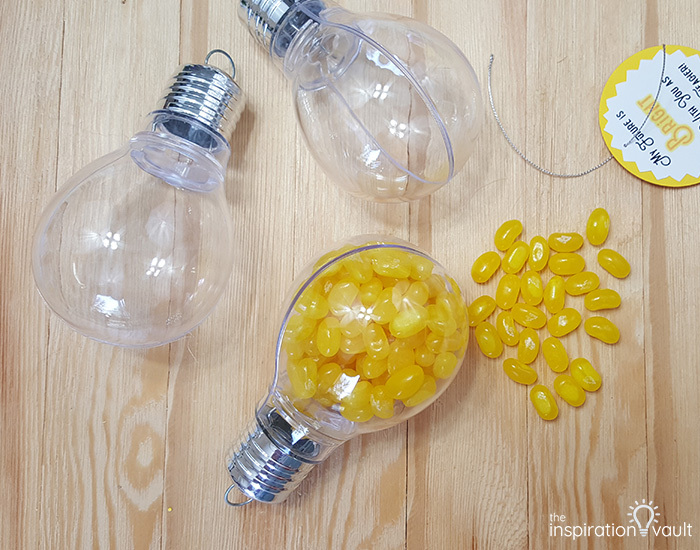 7: Carefully open the lightbulb and fill it with the yellow candy, but not too much. 8: Feed the silver cord with the tag attached through the loop at the top of the bulb and tie it off with a simple square knot. That’s it! 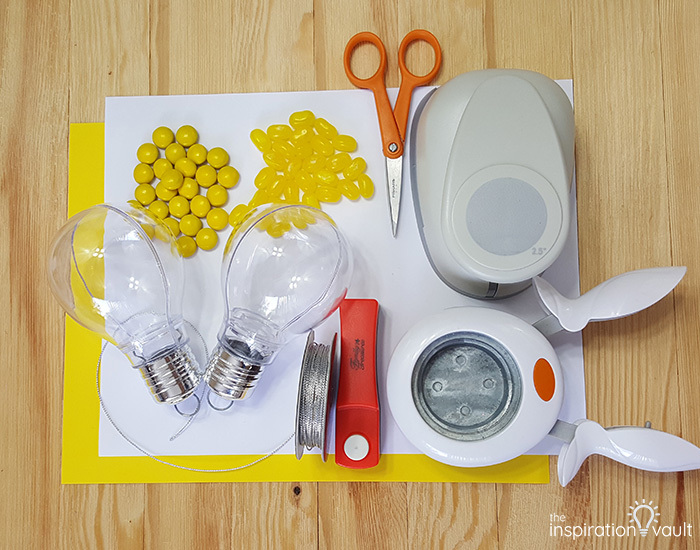 Like the title says, these Light Bulb Teacher Gifts are Quick & Simple to make. 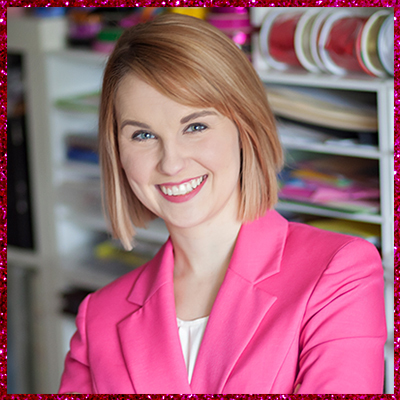 I also like that I went old school with the punches and the zigzag scissors. 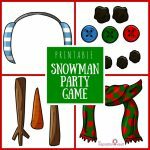 It reminds me of great times with my PTO friends when we used to make all kinds of creative and punny little treats and gifts for the teachers. 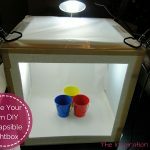 These are great for putting together assembly-line style, too. 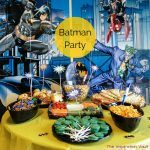 And if your teacher isn’t a fan of lemon jelly beans, you can always use yellow M&Ms or another yellow candy or anything else yellow that would fit. What would you use to fill it? If you want to get really creative, be sure to see the Tasty Marshmallow Apple Treats Aleisha made for her son’s teacher. 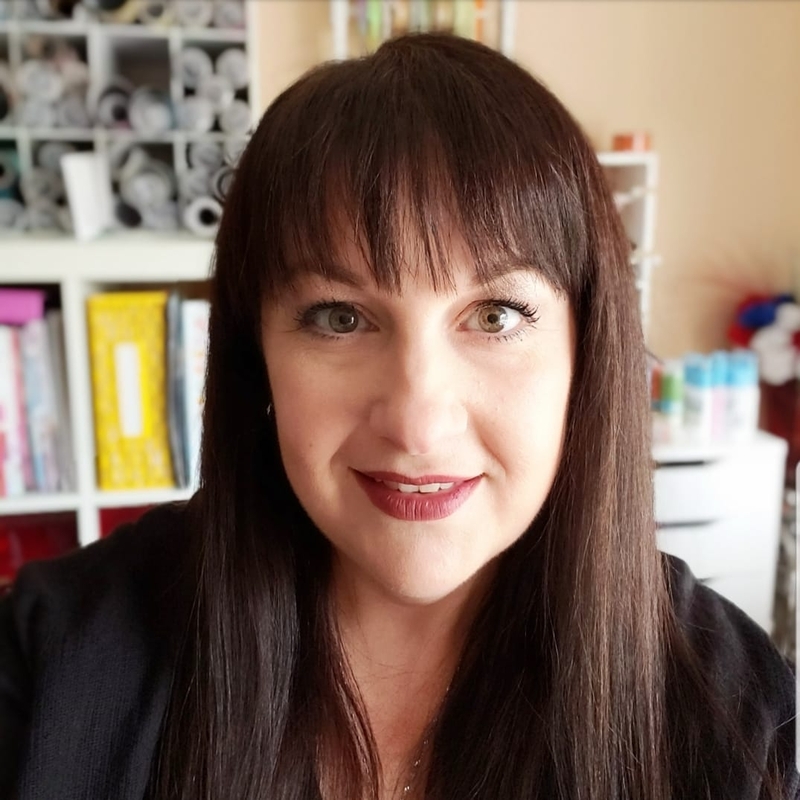 And if you’re done searching Pinterest for teacher gift ideas, you should check out Favecrafts. They have so many ideas on there I haven’t even seen pinned yet. 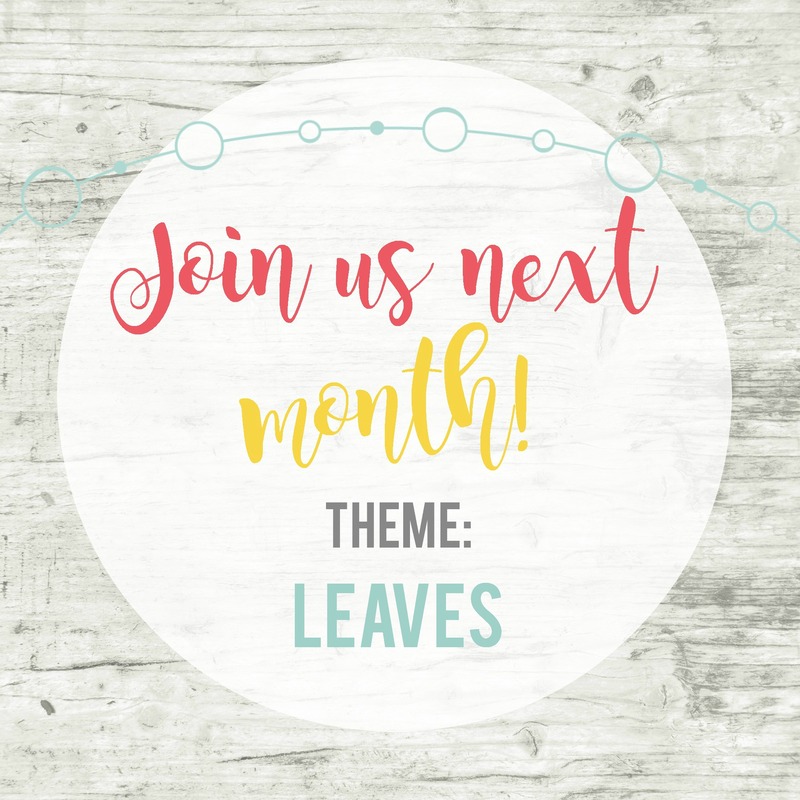 This project is part of the Inspire My Creativity link party which happens every month on the 2nd Wednesday with timely themes. This month we’re tackling Back to School. 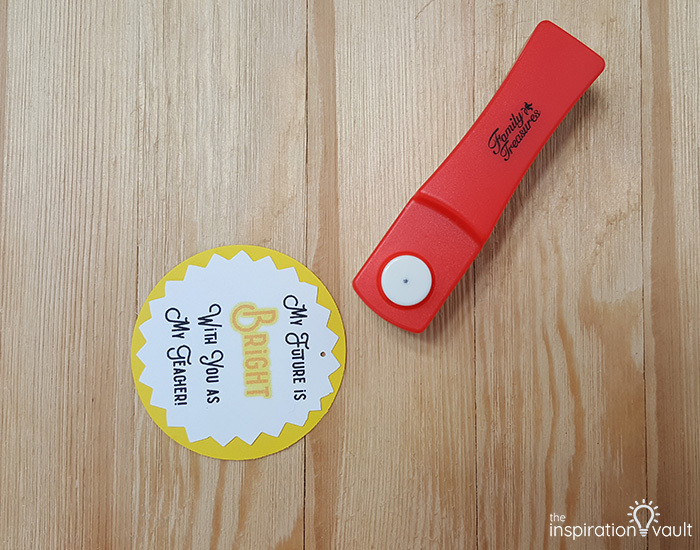 Now let’s see what other fun Back to School projects our crafty friends have come up with this month! I love how these turned out! 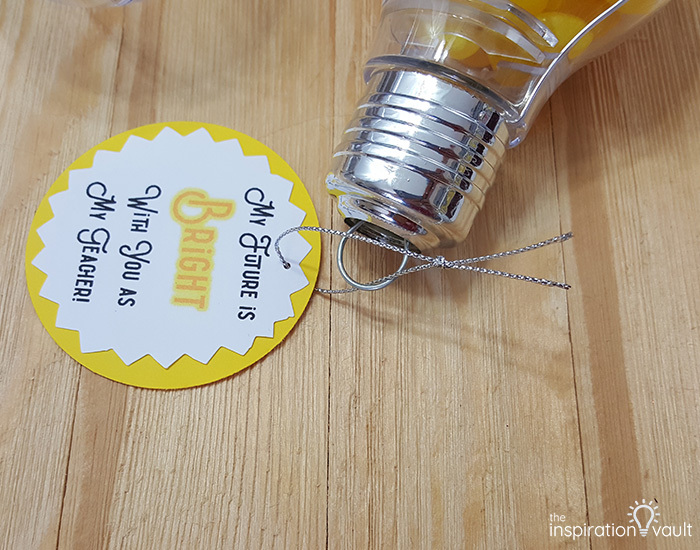 You could use these light bulbs at almost any time of year as a teacher gift. 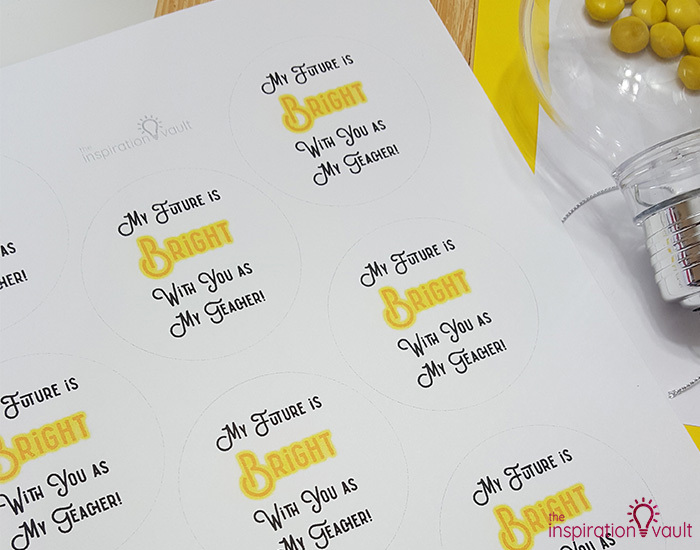 These are adorable! I love how bright and colorful they are. 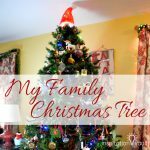 Sharing and pinning!